This year (2012) sees the 25th anniversary of the footpath known as the ‘Templer Way’, a route which follows the old granite tramway from the Haytor quarries to Teignmouth quay. So maybe this would be an appropriate time to have a look at the Haytor quarries and see what went on there a couple of hundred years ago. Although a big part of the functionality of the quarries was the granite tramway I do not propose to say too much about it, there are far better informative websites out there which focus on that topic. So, let’s turn the clock back to 1765 when one James Templer purchased the Stover estate, these lands covered some 80,000 acres and included some heathland in the Bovey basin and Haytor rocks. During this period ball or pipe clay was being commercially extracted from the Bovey basin and then was transported by packhorse or cart to Newton Abbot. From here it went by river down to Teignmouth from whence it was then dispatched to the various markets. This clay was renown for its pure white quality which was ideal for use in the production of pottery. From 1765 Josiah Wedgewood was using the Devon clay in his ‘Queensware’ pottery which soon became a popular product. So much so that other pottery manufacturers began to set up in competition to Wedgwood, this greatly increased the demand for Devon clay. Unfortunately, because the Bovey clay had to be transported by the slow and laborious horse power it meant that the local producers could not compete with their competition. In 1792 James senior died and James junior took over the reigns, in the same year he opened the Stover canal which ran from Newton Abbot to Teignmouth. Needless to say this made the transportation of the clay, easier, quicker and cheaper and also allowed local producers to compete in the market place. One such example was a Chudleigh producer called Pike, in 1791 he tendered for Wedgewood’s business but was not competitive enough, however in 1798 he was successful, such was the impact of the canal. By the early 1800s there was a huge demand for quality building material in various large-scale projects, one of which was the construction of London Bridge. It was a well known fact that there was good quality granite up on Haytor which was both attractive and hard wearing. By this time the Stover Estate was in the hands of George Templer, James juniors son, and he was only too well aware of Haytor’s granite’s quality. Firstly the mansion of Stover house was built from it along with the church at Teigngrace. 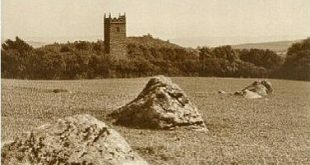 Realising the potential business opportunities in the building stone market George Templer began to exploit the granite resources up on Haytor Down. Once again transportation of the stone was a problem as it all had to be carried by horse and cart down to Teignmouth and as before this proved costly and time consuming. But George had the solution, build a tramway from the quarries to the port. However, there was one slight problem, iron for building the rails was not easily obtainable in the locality. Therefore he decided to do what moormen had done for centuries, build the rails out of the nearest natural resource, that being granite. Accordingly in 1820 the Haytor Granite Tramway was opened, it ran the eight and a half mile distance from Haytor and Holwell quarries down to the Stover canal, a descent of some 400 metres. The impetuous for this initiative was that George Templer had won a contract to supply stone for the building of the new London Bridge (the one that now resides in Arizona). On the 16th of September 1820 the final project (which reportedly cost in the region of £30,000) was opened and to mark the occasion George Templar hosted ‘a bit of a do’ to which local dignitaries and residents were invited. According to local press reports of the day, the event involved a procession of decorated wagons and carriages which ran from Bovey Heathfield up to Haytor where speeches were made. This optimism proved to be short lived because in 1829 the entire Stover estate had to be sold along with the tramway and Stover canal to the then Duke of Somerset, Edward Adolphus Seymour. George Templer was appointed as the granite company’s Devon agent but it seems due to numerous inefficiencies the granite company continued to suffer, especially in the face of some strong competitors. Over the next few years the granite company began to lose large contracts and by 1834 it was reported that the quarry workers had many grievances, among which was the fact they weren’t getting paid. A lifeline was offered in the form of a contract to carry iron ore from the nearby Haytor Iron Mine (of which George Templer also had an interest) on the tramway. All it would have meant was the construction of an extension to the tramway linking it up to the mine, for whatever reason this was never accomplished. In 1843 George Templer died as result of a hunting accident, his funeral was well attended by local folk whom he had helped and employed over the years. By this time very few workers were being employed at the quarries. There was a brief revival of the quarries in 1850 but due to ever increasing competition and the age old problem of outdated transportation methods the industry at Haytor has finally ceased by 1858. That was a very brief outline of how the quarries and tramway came into being, as noted above there are several excellent websites giving a fuller account of the Templers and the quarries. Much of the above information has been gleaned from the books listed in the reading list below, especially those marked with an asterisk. Having briefly looked at the whys and wherefores to the background of the Haytor quarries maybe it’s time to get down to the nitty gritty, or should I say nitty granitty. Firstly, as can be gleaned from above, the granite on Haytor Down is of a superior quality both in attractiveness and durability, hence the location of the quarries. There are in fact five separate quarries on Haytor Down; Haytor Quarry, Holwell Quarry, Rubble Heap Quarry, Harrow Barrow and Western Quarry. All were eventually linked by the granite tramway which in modern days has become the ‘Templar Way’. As with any landscape the best way to study it is to don some boots and get out into the midst of it. Therefore heeding my own advice I chose a day when the weather forecast looked reasonable, got up at the crack and parked up just as the sun was rising above Teignmouth. This alone made the journey worthwhile as did the view of the ‘in-country’ with all its valleys filled with mist. The intention was to follow the route of the granite tramway whilst visiting each quarry along the way. The first section of the tramway runs from where it crosses the Manaton road at Ordnance Survey grid reference SX76921 77523 (see photo above) up to the Haytor quarries. This was the location of one of the two sidings associated with the tramway, the other being at Holwell Quarry. There are two explanations as to its purpose, one was that it was a place to store wagons or secondly the siding may well have been used for unloading stone in which to build the nearby houses at Haytor Vale. Additional ‘blue sky’ thinking also mutes the theory that it was used for ‘ripping‘ stone, this was a practice whereby moorfolk would themselves gather smaller granite rocks from off the moor and then sell them to the company. If this was the case the Manaton road would have provided easy access to the wagons. OK, the tramway, from the junction of the road to the Haytor Quarries is a distance of 0.79 miles (1.26 km) and as can be seen below an ascent of 163.6 feet (49.9m). As you first wander up this section it soon becomes clear as to the construction of the granite tramway, there is no standard size to the granite slabs which form the rails as they vary from between 4 and 8 feet (1.22 – 2.43m) although on a curved section they would be shorter. On average each slab ranges from between 12 and 15 inches (30.48 – 38.1cm)wide with a depth of roughly 10 (25.4cm) inches. Each slab was fashioned so that there was a cut on the top side which was around 7 (17.78cm)inches from the inside edge, this formed a 3 inch (7.62cm) deep rebate and created a lengthwise flange along which would run the iron wheels of the wagons. The gauge of the single track tramway was 4 feet 3 inches (1.29m) on which the flat topped wagons would run, Harris, pp. 23 – 24. It is considered that the wagons were around 13 feet (3.96m) long and had a wheelbase of 10 feet (3.04m), the wheels were flangeless with a diameter of 2 feet (0.61m) and a width of 3 inches (7.62cm). As will be seen later, some of the descents over which the tramway ran are steep to say the least and it appears that the braking system on the wagons merely consisted of a 12ft (3.65m) pole that was manually pressed against the rim of the wheel, Ewans, p.24. The power for drawing the wagons came from two sources, gravity and horse. It has been suggested that horses were used to either pull the wagons up inclines or hold them back whilst descending, each train usually consisted of 12 wagons. After following the tramway up for about half a mile (0.79km) you come to the first set of points, it was here that the wagons would be diverted to either enter or exit the approach to the Haytor Quarries. The way that these points worked on the tramway was that larger slabs of stone were fashioned with 6 inch (15.24cm) wide by 3 inch (7.62cm) deep hollow grooves. A hole was then drilled into the block into which pegs were fitted onto which were fitted cheek plates. This combination would then enable the wagon wheels to be directed onto the chosen track, Ewans, p.22. Near to these points can be seen one of two granite Templer Way stone markers, these were commissioned as part of the 25th anniversary of the Templar Way. The unveiling ceremony took place in October 2012 and was attended by around 75 people who marked the occasion. Then next obstacle which faced the tramway builders was that shortly after leaving the main track the route had to cross the remnants of earlier tinner’s activity in the form of some stream works. This was achieved by building a large, granite embankment which spanned the width of the obstacle thus carry the trackway on into the quarries. By no means was Templer and his quarrymen the first people to extract granite from this location because there is evidence of a Bronze Age hut circle and reave sections located just to the south of the quarry which can be identified on the aerial map above. It does not take much imagination as to where the stone from the hut circle came from, and just maybe these early folk also knew of the superior quality of granite to be found here. As such hut circles are seldom found alone it does beg the question as to what other feature are lying under the spoil heaps. Haytor Quarry is said to have been the most productive of the five quarries in the Haytor Down group and was in production between 1820 and 1850, it covers an area of about 9 acres (4 hectares). There are two areas or quarries from which the granite was extracted, there is the larger site (marked “Main Quarry” on the aerial map above) and the smaller one to the north-east (marked “Secondary Quarry” on the aerial map). It is the ‘Main Quarry’ that was the first to be exploited but there is a suggestion that both quarries were worked at the same time for a period. The Haytor Granite was used in many famous building and statues around the country, just a few in London alone being; London Bridge, The British Museum, The National Gallery, Christ’s Hospital, The Waitham Obelisk, William IV’s statue, Goldsmith’s Hall, Fishmonger’s Hall, Covent Garden Market, etc. Although not used in the building of the Science Museum, some Haytor granite found it way inside as an exhibit in the form of a stone rail from the tramway. The was a gift from one D. Jeffreys-Jones in 1936 though how he acquired it remains a mystery. Today the ‘Main Quarry’ comprises of a deep pit which is encompassed by vertical, worked rock faces and covers an area of about 1 acre (0.5 hectares). The pit now forms water filled ponds which are now home to, lillies, other aquatic plants and small willow trees along with dragon and damsel flies, newts etc. When I first visited the ponds there was a shoal of goldfish in residence but on this latest occasion there was no sign of them. How they got there originally nobody knows, one suggestion was that someone dumped the fish after winning them at Widecombe Fair? Apparently these fish have upset the ecology of the ponds because they devour the insect larvae and tadpoles which results in their droppings adding to the nutrient levels of the ponds, so says the Dartmoor National Park Authority. Get a life! what’s more interesting, a unique part of the local tradition (you won’t find ‘wild’ goldfish anywhere else on Dartmoor) or some tadpoles? Also give that fish population some credit, if they can survive Dartmoor winters at 400m for all those years then they should be welcome to a few skanky old tadpoles. I know what makes for a better story out of the two. Anyway, I digress, there are two entrances to this quarry, one at the southern end was most likely the first to be used as this was where the initial granite extraction began. The other entrance is located at the north-western end of the quarry and actually cuts through earlier heaps of ‘overburden’ (earth that initially covered the granite) from earlier activity. Most of the wasted granite ended up on one of five spoil heaps the largest of which is around 295 feet (90m) long and 115 feet (35m) wide. They are comprised large, waste cut blocks of granite with possibly some stone chips and overburden in the core. There is also surviving evidence of buildings and a possible garden plot which are located at the base of the northern overburden spoil heaps. A possible later feature is the remains of what appears to be a World War II artillery or mortar placement located to the west of the quarries. Back inside the main quarry can be seen a few remnants of the quarrying operation in the form of parts to a large crane which consist of an iron winch, and its broken boom floating in the ‘goldfish pond’. The stanchions which acted for the bases of the tension cables that held the crane erect are also visible. These consist of an iron pegs through which an iron ring has been inserted thus allowing the cables to be fixed, Newman, 2011, pp. 186 – 190, Pastscape Record, No.1220525. The granite was extracted by means of blasting it out with gunpowder or hacking at it with a pick, the blocks were then moved, by means of the crane to locations where the rock would be split and fashioned into the requires shapes and sizes. This was done by a method known as ‘tare and feather’ and involved firstly making a series of holes along the rock. This was done by means of a heavy, pointed iron bar known as a ‘jumper’. Into each of the holes would be placed pairs of metal rods called ‘feathers’ and once in place a wedge-shaped, chisel-like piece of metal, the ‘tare’, would be hammered. This would be done all along the series of holes until the rock split once the rock had been split it would then be trimmed and shaped into the required sizes. It appears that Haytorite was first discovered at Haytor Rocks, hence the name although today it’s more commonly described as a “pseudomorphous mineral occurring in crystals having the form of datolite but consisting of chalcedony.”. Sorry about that diversion, just stumbled across it whilst researching the quarries. So to finish this section, clearly with such industrious quarrying there was a need for the workers to live somewhere and so to solve that requirement George Templar built some houses. According to Hemery p.694, there were dwellings actually located near to the main quarry and later when the workforce increased further others were constructed at nearby Haytor Vale. In addition there are also reports that an inn was located here and no doubt, due to the hard labour involved with quarrying , did a roaring trade, Ewans, p.25. Having looked at the Haytor Quarries it will now be time to move further on up the tramway to Holwell Quarry. Due to the length of this page this next leg can be found by clicking the picture below. *Ewans, M. C. 1966. The Haytor Granite Tramway and Stover Canal. Newton Abbot: David & Charles. *Harris, H. 1994. The Haytor Granite Tramway and Stover Canal. Newton Abbot: Peninsula Press.